Back in the good old days, before the advent of the Game Boy, Game Gear and the real boom for handheld gaming, there existed a number of devices that allowed you to play just one game. The main players in this market were Nintendo (surprise surprise) with their Game & Watch series of handheld games, but they weren’t the only ones involved. 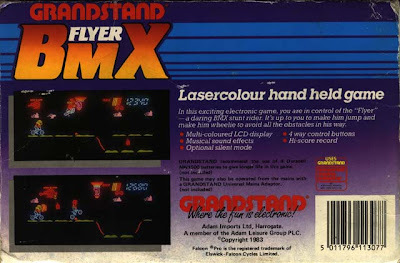 Grandstand had a wide range of handheld and tabletop games available, as well as companies like Systema, CGL, and many others. I owned several handheld games. If I had to pick the best of the bunch, it would probably be Bombsweeper by Nintendo. But a close second would definitely be this little gem by Grandstand. 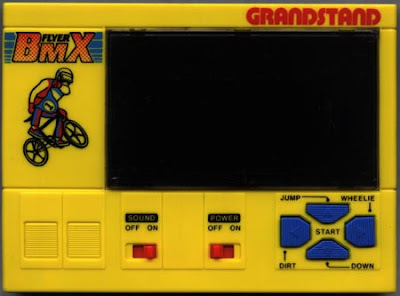 Using simple LCD technology, boosted by a bright backlight and with a coloured overlay, the “graphics” looked superb, in fact some of the best LCD graphics games ever made used this style of graphics. Unfortunately, this was at the expense of battery life, but I tended to use the adaptor anyway, so I really didn’t mind. 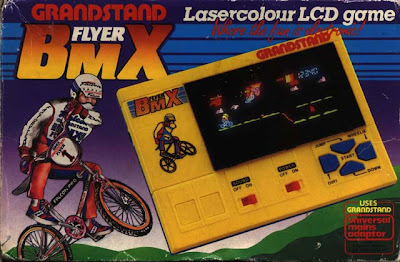 Onto the game itself, then… You are the “BMX Flyer”, a BMX-riding stuntman type person, and your mission is simple, get from the beginning to the end of each course without crashing. This would be a very simple game if there weren’t plenty of things along the way that would cause you great pain and misery, not to mention the loss of a life. These range from cans (at least I think that’s what they were meant to be) on the floor, to short pits, long pits, and birds, and that’s just the “natural” hazards. There’s also a couple of people out to get you, i.e. the bomb-dropping helicopter pilot (a bit extreme for a BMX game, perhaps), and the evil rider who either slows down in front of you for which you must jump, or comes up behind you every now and again, but you can simply fart in his face to get rid of him. Sorry, did I say fart? I meant to say throw dirt. But I know what it looks like. Anyway, although the game throws a lot at you, there are a couple of things to help you along the way. There is an energy meter, which can be replenished by means of Water Bottles along the route. Certain actions, such as jumping and throwing dirt, use your energy, so it’s important to keep your energy levels up as much as you can. Also helpful is the balloon that comes along every now and again. Jumping and catching hold will give you a nice bonus as well as a free ride past several obstacles, dropping you off almost at the finish. But as a game, is it any good? Oh, yes. The game forms a nice little challenge, obstacles come at you in varying degrees and with alarming regularity. The choice between expending a little energy with the dirt or avoiding your enemy by means of using the obstacles to help keep him at bay can often mean the difference between survival and “death”. As an 80s handheld game, it’s certainly a collectable bit of history, and if you did manage to find one working (like mine, it still works! In fact, I’ll try and get it videoed.) you’ll soon be humming the chirpy little tune it plays, which I’d quite like to pay tribute to by means of XM music. As far as handheld gaming goes, prior to the advent of the Gameboy, this is as good as it gets. See one, want one, get one. Simple as. Interestingly, I’ve found a Flash remake of this game, unfortunately the gameplay isn’t quite as accurate as I’d like, but it gives you a good indication of how the game played and looked.